Quick joke. What are the three rings of marriage? First, there is the engagement ring. Then, there is the wedding ring. Finally, there’s the suffering! I had no idea what I was doing when I first got married as a young man. It was quite a shock to me to learn that a man had to buy an engagement ring and a wedding ring. “Oh well,” I said to myself. At least diamonds are a valuable investment. I could not have been more mistaken. When I was in my 20s, I just had no idea how the world worked. Once, I had to pawn my wedding rings for quick cash. I was quite horrified to learn that I could only get an obscenely small percentage of the rings original value. The situation was quite unfathomable to me. Unfortunately, it would take me a few more years to fully appreciate just how much little value diamonds inherently have. In 20th century popular culture, sly and cool characters would chase after diamonds in crime caper and heist films. Or, criminals would meet in dark alleys to trade diamonds in exchange for shady deals. The reality is much more different. Diamonds have no inherent value. They are not rare and are not a really good investment either. In fact, we only use them in our engagement and wedding customs because of a promotional media campaign for diamonds initiated almost a century ago. In the 1800s, diamonds and other related gems were very rare. Only about a few pounds of diamonds were found each year in countries like India or Brazil. The only people flashing diamonds at the time were members of royalty. By the late 1800s, large diamond mines were discovered in South Africa. So many diamonds flooded the market that they become worthless. Englishman Cecil Rhodes bought all the diamond mines in South Africa and created a diamond cartel. Then, they bought almost all other diamond mines in the world or crowded out competitors. They did this to restrict supplies and control the price. The cartel also controlled who got to sell their diamonds. Additionally, they created an advertising campaign in the 1930s to entice people to buy diamonds as a sign of courtship. “A diamond is forever,” and the notion that you must save two months of salary to buy a diamond are just ad slogans. Slogans designed almost a century ago by businessman trying to get people to buy diamonds, which no one wanted at the time. Retailers buy diamonds from wholesalers at predetermined prices. Retailers only pay for diamonds they buy after they are sold. 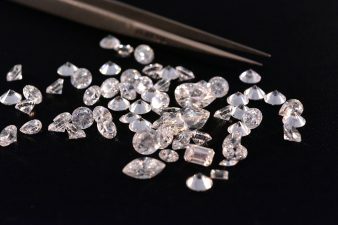 Diamonds can be marked up by as much as 300%, or more. Haven’t you noticed that when you try to pawn or resell a diamond ring, you are offered basically nothing? If you tried to sell a $1,300 diamond ring, you might be lucky to get a $65 offer. Most jewelers don’t want to buy back the rings they sell. It ruins the illusion that diamonds are valuable. Also, it can endanger their profit margins to buy back diamonds at inflated, retail prices. “Diamonds are forever,” was a slogan designed to subliminally convince people not to try to sell back their rings. Unless you are investing in those giant gems that are displayed in museums, diamonds are not a good investment. Nor are they rare. In 1982, there were an estimated 500 million carats in public circulation. Well over 100 million women owned diamond rings at this time. Also, the Argyle diamond mine in Australia was discovered in 1982. From then until now, the mine has processed over 800 million carats. Does that sound rare to you? The average diamond ring costs about $5,500. Nothing is probably going to stop you from buying one in conjunction with a marriage. The practice is now cultural custom, even though it originated in an advertising office. I suggest that you also invest in property, stocks, or investments. Create some real monetary value to rely on after getting married besides a diamond ring. My wife wanted a different gem for her engagement ring. I was happy because most other gems are less costly (but still more valuable). Not to mention black opals are one of the most beautiful gems in the world.